I’ve been recently re-reading Chapter VIII of The Children of Húrin in anticipation of our Hall of Fire chat tomorrow. One thing that particularly struck me is the invidiousness of Túrin’s position on Amon Rudh: whether he and his growing band of outlaws fight or hide, their prospects are grim. “…a king or the lord of a great host has many needs. He must have a secure refuge; and he must have wealth, and many whose work is not in war. With numbers comes the need of food, more than the wild will furnish to hunters. And there comes the passing of secrecy. Amon Rûdh is a good place for a few – it has eyes and ears. 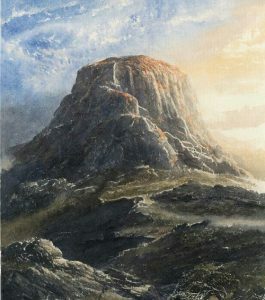 In Dor Cúarthol, Túrin has too many people to hide yet too few to do more than (to repurpose Elrond’s words in The Lord of the Rings) arouse the wrath of Angband. Still, even if the situation seems hopeless, it’s nevertheless understandable that Túrin wants to take up arms against a sea of troubles. And to do so sooner rather than later. As Húrin observes to Turgon in Gondolin, Men are unlike the Eldar: they cannot wait for some distant day when the odds might be in their favour. Like Húrin and Huor, Túrin must involve himself in the struggle while he has the strength of body to make a difference — however small. Even if all he can do is burn Angband’s fingers. When Túrin’s responds to Beleg that he will be the captain of his own host, and that if he falls, he falls, perhaps this is something weighing on his mind? Also, as readers who understand the wider story, we know the cause *is* hopeless. The Noldor and their allies cannot defeat Morgoth themselves. Mandos bluntly says so as he pronounces The Doom of the Valar on the Fëanor and his folk. And Fëanor finally realises the truth of this as he lies mortally wounded on the shores of Middle-earth. Turgon realises this too, until misplaced pride in his achievements takes over. The best that Túrin, or, indeed, any of the Noldor, can do is to buy time. So, is it then to Túrin’s credit that he succeeds for a short time? If nothing else, Dor Cúarthol’s brief existence gains Nagothrond another year. Is that enough to justify what might otherwise appear to be a stubborn choice? Given that all roads appear to inevitably lead to ruin, is Túrin’s choice here so terrible? And where could he have led his increasingly visible army that they would have been accepted anyway? If you have your own thoughts on this chapter of The Children of Húrin and would like to share them, consider joining us for the Hall of Fire chat tomorrow at 6pm ET (New York time). To join the chat, just click this link.